It’s mid week, we just had a torrential rain storm here in Northern California and most of us are itching for more racing (hold your horses, Folsom Winter Criterium and Coppertown Circuit Race are on the schedule this weekend!). To help us all get through the week and stir up excitement for more crit racing, check out these on “bike” (and helmet) videos from racing around the globe over the last few weeks. We start with some SoCal crit racing; then onto some 80’s era Mega-Movie (Top Gun) sound set to Caleb Ewan’s Sprint win at the Jayco Suntour; and finally top it off with a dramatic crash in slow-motion from Australia’s premier Tour Down Under. Renowned sprinter Rahsaan Bahati gives a good view of the win with an enourmous amount of on-screen data (where’s the power data Rahsaan?) and even better commentary. As a crit racer, I feel the nerves just watching this. Next is Justin Williams’ video of the race, giving another perspective (and the perspective we all want), in winning. Caleb has a rocket finish and it’s especially interesting to see his head appear in the camera frame during the final 100m. 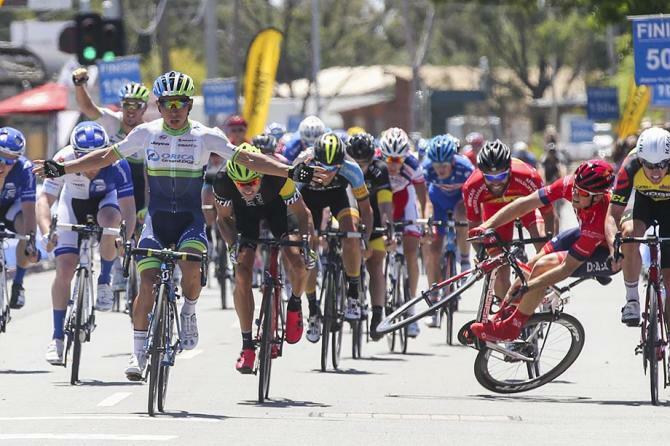 Not captured on the film however, is William Clarke of Drapac with an impossible 5th place (sliding). Just watch it. I’ll bet you can’t watch it only once. Dramatic, tramatic and yet mesmerizing.